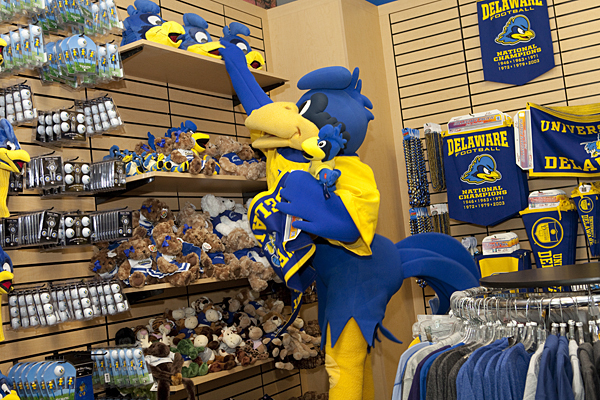 YoUDee goes shopping in the UD Bookstore's DelaWear section, on the first floor. 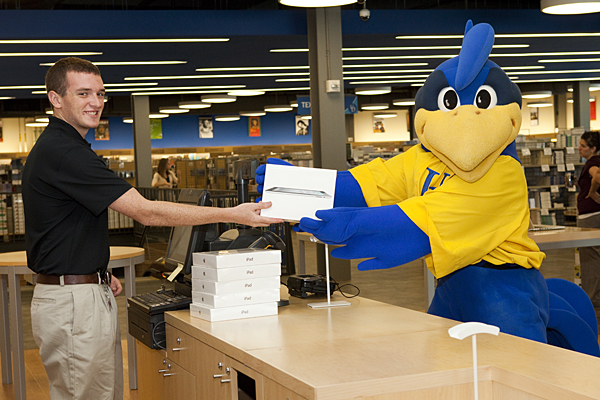 YoUDee picks up an iPad in the Apple Authorized Campus Store, on the second floor of the UD Bookstore. YoUDee, exiting out the textbook section on the second floor of the UD Bookstore, was one of the first customers Monday. 3:17 p.m., Aug. 1, 2011--Offering everything from cappuccino to computers, the new University of Delaware Bookstore -- centrally located on Main and Academy streets in downtown Newark -- attracted a steady stream of customers on its "soft opening" day, Monday, Aug 1. Welcoming the public and members of the campus community, the UD Bookstore’s opening comes less than a year after the University and Barnes & Noble opened the ground on this property on Aug. 30, 2010. Doubling its size to 38,000 square feet, the facility is home to the Blue Hen Café and an Apple Authorized Campus Store. Shoppers also have a wide range of items to choose from, including textbooks, general fiction and nonfiction books, technology accessories and an array of clothing and UD items. 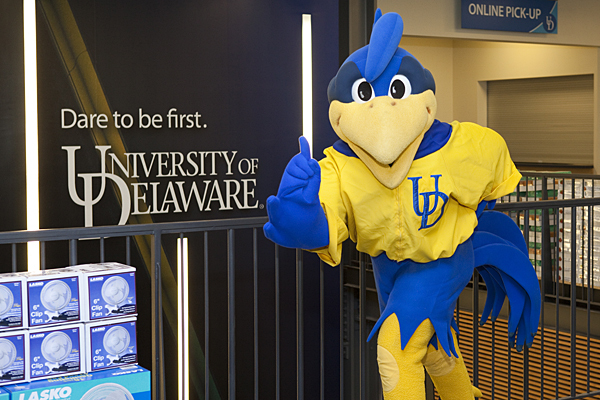 Among the earliest visitors to the UD Bookstore were University President Patrick Harker and fan favorite University mascot YoUDee, who was said to have purchased one of the popular Apple iPads. The Blue Hen Café, located just inside the store’s Main Street entrance, offers Starbucks coffee and baked products and the pints of ice cream from the UDairy Creamery. Open and airy, with plenty of natural light streaming in through windows of all sizes, the UD Bookstore's two floors -- a third floor features space for the offices of Development and Alumni Relations -- boast a wide range of UD-trademarked merchandise, including a sweatshirts, T-shirts, rain boots, greeting cards, sunglasses, hats, notebooks, candy and golf balls in its DelaWear section. Jennifer Galt, bookstore manager, said it was exciting to be opening on schedule, with customers clearly enjoying their shopping experience. Eric Nelson, manager in the Office of Communications and Marketing, who is managing UD's Apple Authorized Campus Store, said that with exception of iPhones, the store offers the full line of Apple products to UD students, faculty and staff. Adjacent to the Apple Authorized Campus Store is a technology section offering everything from computer accessories to printer cartridges. Also on the second floor are textbooks, reference books and personal and dorm items, including fans, comforters, mirrors and single room refrigerators. Visitors can also peruse the trade book area located on the first floor at the base of the escalators to find their favorite authors represented in mystery, science fiction and romance genres. That section also has an extensive offering of nonfiction titles to complement an eclectic mix of Barnes and Noble classic works of literature. The UD Bookstore also offers the Barnes & Noble Nook e-textbook application for PC and Mac users. The UD Bookstore’s grand opening is slated for 11 a.m., Thursday, Sept. 1, and will include a book signing and talk by entrepreneur, Sam Calagione, author of Brewing Up a Business, which chronicles his experiences as founder of the Dogfish Head Craft Brewery. • Sunday: 10 a.m.-6 p.m.